Gaines, on Brains: "Gaines, on Brains" turns 1! It was a year ago today—around this time of day, too—that I was sitting in my apartment at my new school, not quite sure how to spend my first weekend in this strange new town. My laundry was done, I'd already gotten groceries, and I didn't know anybody from orientation well enough to see if they wanted to go to Chocolate World with me. I remember munching on a sandwich when it suddenly clicked that my last name rhymes with "brains" (why didn't I realize this before?! ), and thus I quickly began making my science writing dreams a reality by creating this blog. 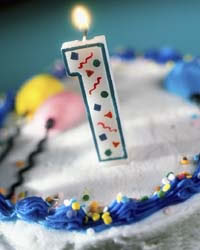 Today "Gaines, on Brains" turns 1, and what a year it's been! I've since started science blogs with LabSpaces, PennLive, and my latest work-in-progress, Psychology Today magazine. My writing has been featured during my stint as a guest blogger for Scientopia, I've been linked by MSNBC, and was interviewed for the Scientific American Incubator Blog. I've been asked to attend special local events, write up press releases, and I even had the opportunity to interview psychic medium John Edward (believe his claims or not, it was an interesting experience). But most importantly, this blog has allowed me to interact with so many interesting, insightful, thoughtful, and questioning readers—scientists and non-scientists alike—which is exactly how I envisioned my audience when I set out to write about the latest neuroscience research and hot topics. And so, readers, I ask you for a small birthday gift. In the tradition of science writer Ed Yong and the SciAm Blog Network that just turned 1 last month, I want to know—who are you? Do you follow the blog on Twitter and Facebook? These questions are a guide, not a strict format—write as much or as little as you want. I truly appreciate the feedback and opportunities I've received from everybody this past year, and I thank you all for your support and encouragement—as both a writer and a student. Stay neurosciencey!